Note: This thread is locked until the party on February 21st, 2009. *jumps in* I'm here as the other me! Hurray! The thread is now open. I thought you might have forgotten about us! ATTENTION: Please put the link to what you're wearing in your signature. That way, we know what you're wearing without you having to post it every time. Idea suggested by FrighteninLilMonster. Hurray! Bri! Chloe! I'm not alone anymore. You think we should have the party run like RPG like how the mafia is? Hmm....nah. Let's just party our brains out virtually. Or maybe we can. *rushes through the door* guys I made it! Where is everyone its party time! and I cant stay for long! Can NOBODY stay to party? ME! I want pigs in a blanket. YUMMM.. NIce avvie Emma. It's not showing up in my sig (none of ours are), but oh well. Hi Jess, glad you could make it. Hi kimmy, *waves* you're Jackson's stalker! Hi Jenni! I know and me I've gota shoot off laters gota go and see a man about a cat you know how these things are...but I'll be back! Everyone looks fab! I cant wait to see Logan in his tux! Wow look at this place! We did ourselves proud I think people! Yes I mean look at me. *smiles* I did a fine job dressing you Emma. Sorry for the delay. Pigs in a blanket were on the original menu, so these are fresh out of the oven especially for you Bri. Let's see if we can get the music pumping. YAY!!!!!!!!!!! *eats* I love pigs in a blanket Emmaline. I'm here! I'm here! Lol, and got my dress too! Not as many people as I expected but it is a Saturday and you've got to consider the time zones. 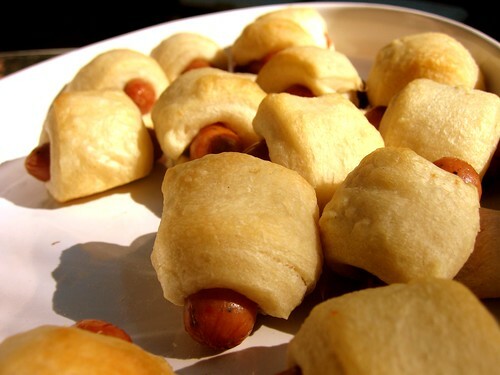 *snatches a pig-in-a-blanket* Love these things! Courtesy of Sarah for getting all the songs together, hope you enjoy the playlist! Tell me if its working, guys. Emma - It won't work on the board for me. It does in the previous posts while I'm typing this, put that's it. Do you have a link to the playlist, like a pop-out-player? I can't see a playlist anywhere ... Is there one up? *takes pig in a blanket* Funny name - like toad in the hole only nicer.